Natural timber arbours meld into the woodland setting. If you go down in the woods, near the Sunshine Coast’s Eumundi, any day, you’d be sure of nice surprises, especially beneath the trees. 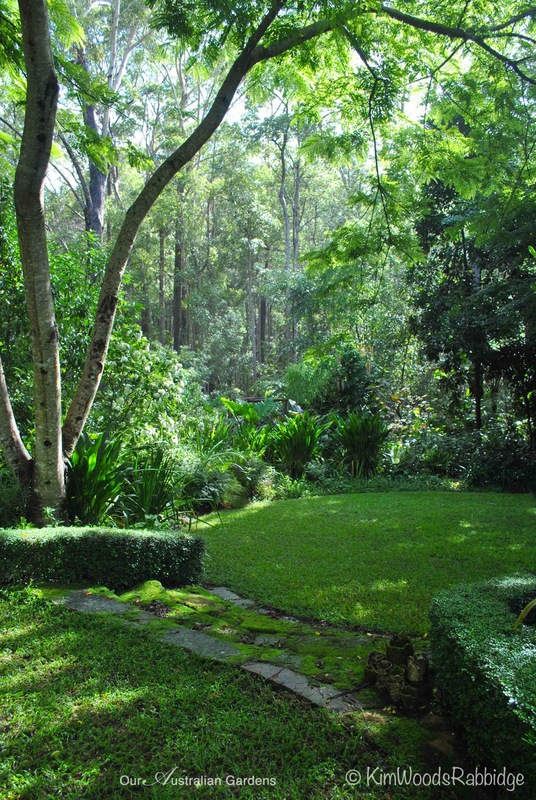 One marvellous surprise is at the end of a dirt track, which is surely a foil because here, nestled amongst a woodland of blackbutt, bloodwood, box and tallowwood, is one of Queensland’s most delightful gardens. The first inkling you’re visiting somewhere special is along the driveway where a couple of two metre-wide sculptures are suspended between trees. They’re like exploding fireworks but made from sticks; and nearby a twig installation is shaped like a tepee. The stringybark cottage where the Boyds first lived is now a comfy nook for guests. Plantswoman and designer Cheryl Boyd. The creative mind of New Zealand born designer Cheryl Boyd is forever active. Twenty years ago Cheryl and her husband Bob used timber, milled onsite, to construct a cottage in which they lived before their home was built. Now an idyllic garden nook for guests, it’s embraced on one side by masses of creamy coloured flowering anthuriums and a backdrop of small ferns, plus giants of the family – tree ferns. A middle story of grand Dikonsonia antartica shelter smaller ferns and anthuriums. Fresh green fronds of native Dickonsonia antartica, and New Zealand silver tree ferns are accented against the glaucous forest canopy. 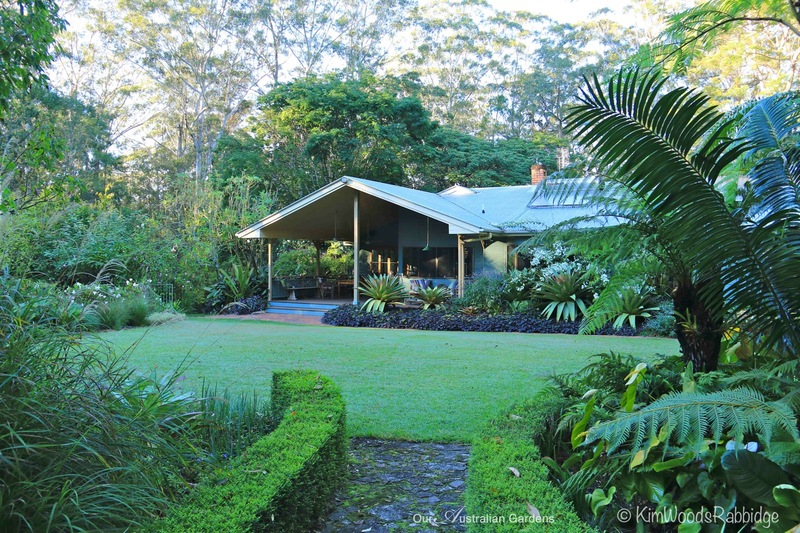 On the southern side of the cottage a row of weeping leptospermum trees provide dappled sunlight for a carpet of caladiums, cordylines, bromeliads and coleus in various shades of burgundy, pink and green. Vibrant, hot-hued flowering anthuriums also take their turn on stage, while amongst cobblestones and pavers, ground hugging mosses and delicate ferns are a little shyer. Arbours frame views and support subtropical climbers. When the 1.2 hectare garden first began to take form, the Boyds used stringybark posts for arbours to support some of Cheryl’s favourite climbers, such as mauve Solanum wendlandii, and Beaumontia grandiflora with its sumptuous white blooms. to use metal or even milled timber. “They wouldn’t have the same character,” she says. A summerhouse at the end of the garden succumbed to the ravages of time. In its place a fantastic stone wall folly unfurls like a fern. Superbly crafted, it’s 1metre high by twenty metres long and inspired by the Māori motif, ‘koru’. Of all the garden’s artful elements, this folly has become the magnum opus. Bright pink epiglotis flower over several weeks. 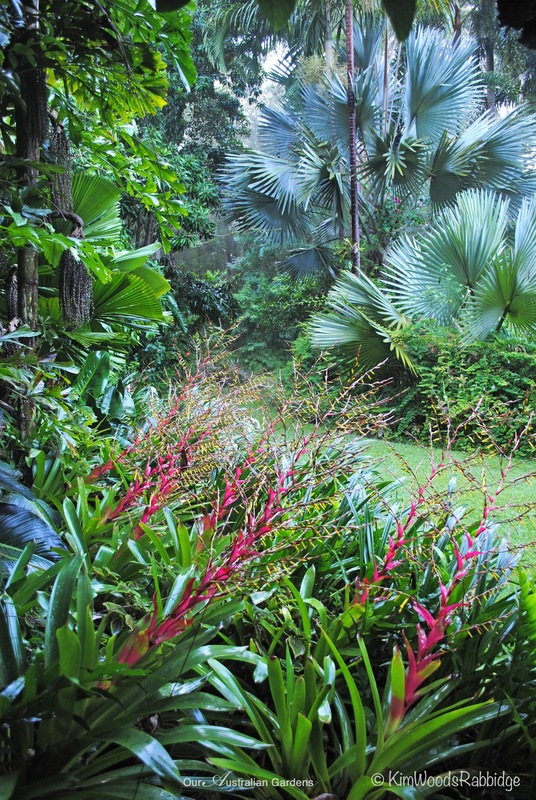 Colour-themed beds of tropical and subtropical plants have been carefully orchestrated by a woman whose incredible plant knowledge has contributed to this garden’s success. “I choose plants first for their foliage, form, and leaf colour,” Cheryl says. “Flower colour is really the icing on the cake, but as flowers often don’t last long, their colour is secondary to leaves”. Swards of lawn are sun-traps in an otherwise sheltered garden. Good average rainfall, shady areas and a natural spring make ideal conditions for plants that like wet feet, while others thrive in drier parts of the garden. 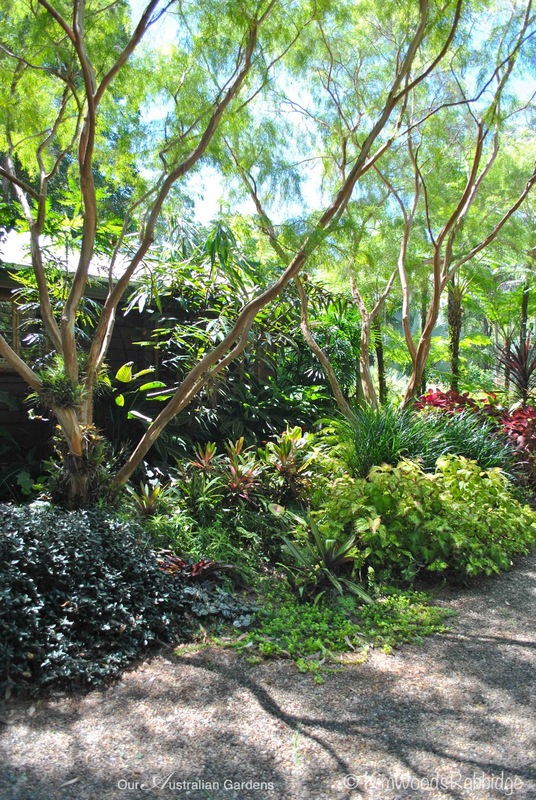 “It’s important to choose the right plants for the right place,” Cheryl advises. In the garden’s early days heavy mulching helped open up and enrich soils. Now it self-mulches and when she can, Cheryl ‘chops and drops’ the prunings that are small enough to leave amongst the beds. An organic fertiliser Nutri-tech is added to new plantings, or those transplanted, and in problem areas organic humates, “improve the soil’s structure, help with water retention and encourage microbes,” Cheryl explains. 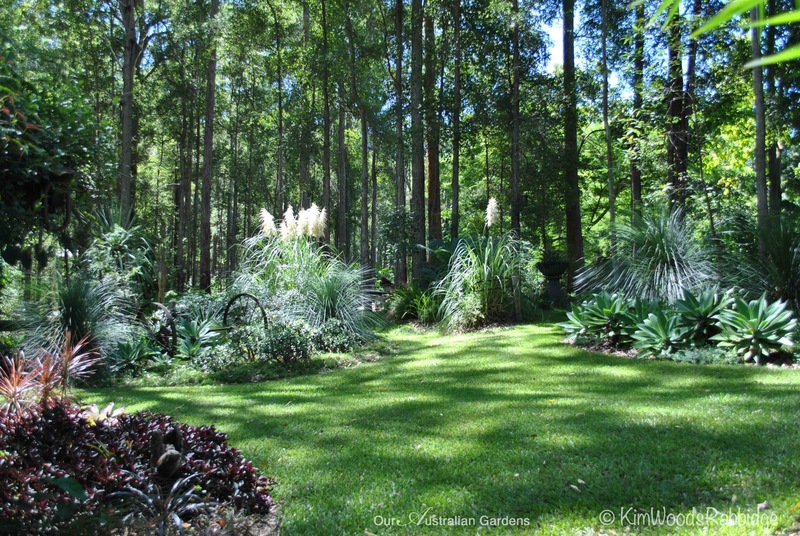 Mass plantings have maximum impact: swathes of heliconias, gingers, hippeastrums and cliveas, and mounds of wispy grasses add seasonal highlights while throngs of agaves and specially selected bromeliads add a textural layer. Palms and grasses are low maintenance plantings by the pool. 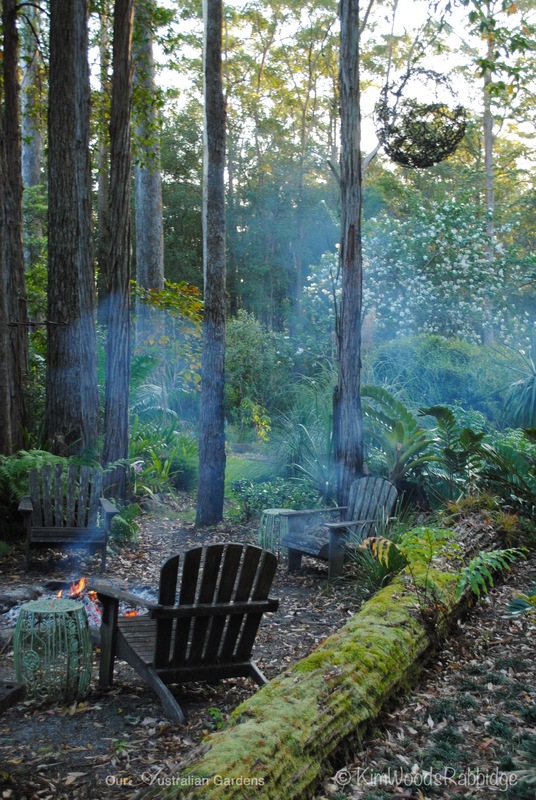 Early morning sun wakens Stringybark Cottage garden and the surrounding bushland. By the veranda bold Alcantarea imperialis Rubra are accents in a sea of purple-leaved sweet potato – an effective subtropical groundcover. A few hedges help define spaces and provide a contrast for exuberant plantings. 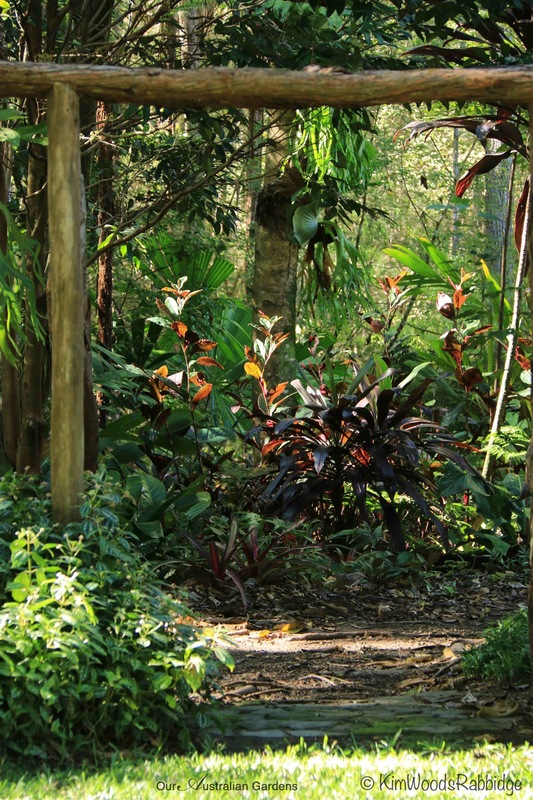 Amongst thriving trees in the garden, several are native to Australian rainforests including Queensland waratah – Alloxylon flammeum, the Powderpuff Lilypilly – Syzygium wilsonii, fern-leafed tamarinds – Sarcotoechia serrata, sunny flowered Brewstia’s cassia, and glossy leaved tree daphne – Phalaria Clerodendrom, whose exquisitely scented flowers emerge from the stems. “There’s such diversity and they’re very hardy. Many are lush, with beautiful flowers that attract birds and insects,” Cheryl adds. Black cordylines in the ‘black’ garden bed. A line of Phyllanthus multiflorus make a lovely informal hedge at the back of a pond, and next to it is a striking collection of black-leaved cordylines. Grass and gravel pathways lead through various areas – some intimate, and others more open. Silvery fronds of Bismarckia nobilis make a dramatic backdrop. Cheryl’s exciting colour combinations, bold textural variations, and ingenious placement of garden art add to the garden’s appeal. It also has a wonderful sense of place that makes visitors want to stay as long as they please. It’s lovely down in the woods, and you may be surprised who’s picnicking there! Stringbark Cottage is the work of a lifetime. I appreciate the enormous amount of blood, sweat, toil and a deep abiding love of gardening that has gone into creating the Stringybark Cottage Garden. The range and variety of plants and the way they have been displayed in this garden is an inspiration to all who see it. 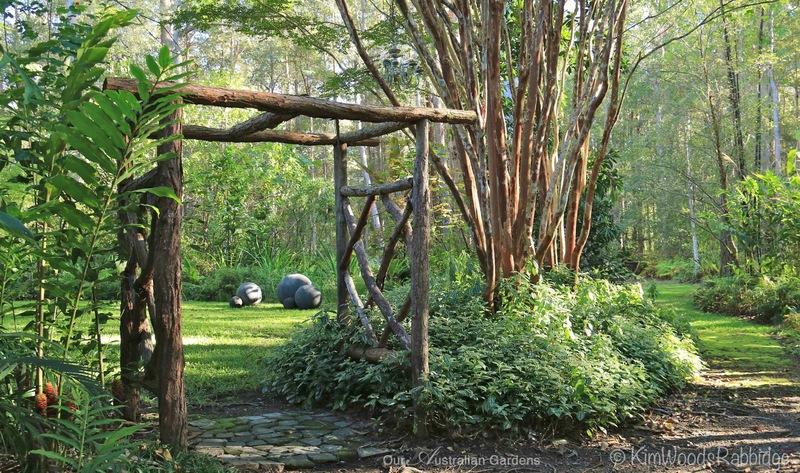 I have long held the belief that there are few enchanting gardens in QLD for someone who is not a big lover of “tropical” gardens – but I was wrong! This place is gorgeous. Thanks for your comment Rowena. I think anything is possible with vision, and with well-placed, thriving plants and fabulous artwork Cheryl has created an atmospheric garden that’s pure joy.